Lewis Hamilton turned a new qualifying lap record to set the fastest lap time in the final qualifying session of the year. It was Hamilton's 82nd career F1 pole and his 11th of the season. The line-up for the weekend was: Mercedes – Hamilton and Valtteri Bottas; Ferrari – Sebastian Vettel and Kimi Raikkonen; Red Bull TAG Heuer – Daniel Ricciardo and Max Verstappen; Racing Point Force India Mercedes – Sergio Perez and Esteban Ocon; Williams Mercedes –Lance Stroll and Sergey Sirotkin; Renault – Nico Hulkenberg and Carlos Sainz; Toro Rosso Honda – Brendon Hartley and Pierre Gasly; Haas Ferrari – Romain Grosjean and Kevin Magnussen; McLaren Renault – Fernando Alonso and Stoffel Vandoorne; Sauber Ferrari – Marcus Ericsson and Charles Leclerc. Pirelli's tires for the weekend were the super soft, ultra soft and hyper soft slicks. Hamilton went fastest in FP3, clocking a 1:37.176 on the hypers. The ambient temperature at the start of qualifying was 82 degrees Fahrenheit (28 degrees Centigrade) and the track temperature was 90 degrees Fahrenheit (32 degrees Centigrade). Raikkonen set the first fast time – 1:37.010 – around the 3.451 mile (5.554 km) 21-turn Yas Marina circuit. Vettel then got down into the 1:36 range with a lap in 1:36.946. Hamilton and Bottas could only manage third and fourth on their first laps. And now the Red Bulls were on their fast laps. Ricciardo and Verstappen moved into fourth and fifth. With five minutes to go, Alonso was 15th and on the bubble, with Perez 14th and Magnussen 16th. With three minutes to go, the Mercedes drivers made another run. Bottas moved up to second and Bottas third as they pushed Raikkonen down to fourth. There was the usual flurry of activity in the final moments. Ocon went way up to fourth and Leclerc to fifth. All 20 drivers used the hyper softs. The five drivers who were eliminated at the end of Q1 were: Hartley, Gasly, whose car stopped on track, Vandoorne, Sirotkin and Stroll. The fastest 15 drivers who moved on to Q2 were: Vettel, Bottas, Hamilton, Ocon, Raikkonen, Ricciardo, Leclerc, Verstappen, Perez, Hulkenberg, Grosjean, Ericsson, Sainz, Alonso and Magnussen. Q2 started at 5:25 p.m. local time. Sunset was at 5:34 p.m. The track was cooling, and the lap times would be dropping. As usual, some of the front runners would try to set their best times in Q2 on the intermediate tires – the ultra soft in this case – so that they could start the race on the more durable rubber. This included the Mercedes, Red Bulls, Force India and Ferrari drivers. Hamilton set a track record 1:35.693. Bottas took second ahead of Raikkonen, Vettel, Ricciardo and Sainz. Then Verstappen made his run and, with seven minutes to go, he only got tenth. "That was pretty &%$#," he said of his slow lap. So Verstappen was on the cutoff line, with Hulkenberg ninth and Magnussen 11th with five minutes remaining. In the final two minutes many of the drivers were back on track. There would be traffic. The Force India drivers were now on the hyper soft rubber. The track was getting very fast indeed, and the order changed constantly. The five drivers who were eliminated at the end of Q2 were: Sainz, Ericsson, Magnussen, Perez and Alonso. The fastest 10 drivers who moved on to Q3 were: Hamilton, Verstappen, Vettel, Bottas, Leclerc, Hulkenberg, Grosjean, Raikkonen, Ocon and Ricciardo. The final Q3 of the season lasted 12 minutes. And, naturally, all the drivers used the hyper soft Pirelli slicks. Q2 fast man Hamilton got down to a 1:35.295, which was 0.057 of second ahead of Vettel and 0.124 of second in front of Bottas. Ricciardo claimed fourth ahead of Raikkonen, Verstappen, Grosjean, Hulkenberg, Leclerc and Ocon. 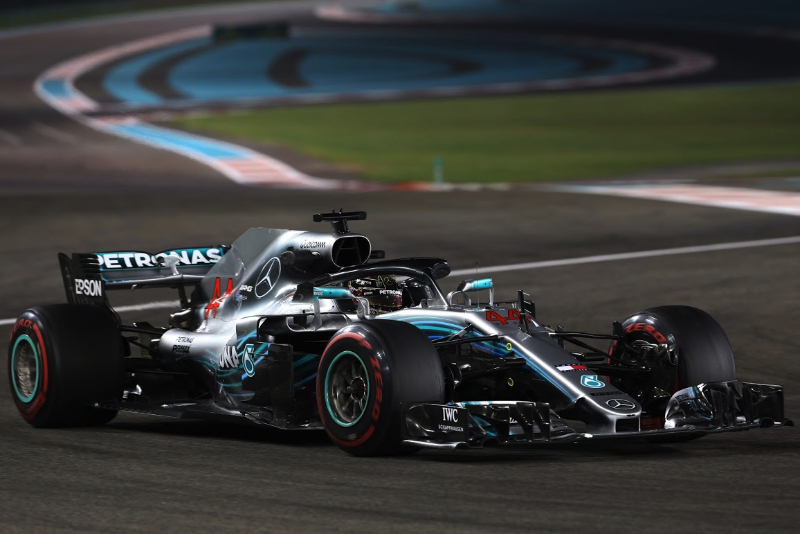 Then it all came down to the final two minutes of the final qualifying session of the 2018 Formula 1 season. Hamilton clocked a qualifying record 1:34.794. Bottas was 0.162 of a second back. Vettel and Raikkonen were next, followed by Ricciardo, Verstappen, Grosjean, Leclerc, Ocon and Hulkenberg.